A pineal germinoma is a common type of germ cell tumor, originating from germ cells left over from embryonic development. While these germ cell tumors are common in the gonads, the ovaries in women and the testes in men, they can occur elsewhere in the body. One of the relatively common locations for this tumor type is in the pineal region of the brain. In fact, of all the tumors that occur in the pineal region, germinoma is the most common overall. They occur most commonly in young adults and children. While most of these tumors are considered malignant, they can vary somewhat in their grade and aggressiveness. While germinoma is the general name for this type of tumor, they are called dysgerminoma when they occur in the ovaries and seminoma when they occur in the testes. The pineal gland is a small part of the brain which lies almost directly in the middle of the head. Several brain tumor types can occur in this region. In addition to a this tumor, the pineal region can be home to other germ cell tumors, teratomas, pineocytoma, pineoblastoma, and even gliomas and other types of brain tumors. Other germ cell tumors include choriocarcinoma, yolk sac tumor, teratoma and mixed germ cell tumors. Most of these tumors can occur in the pineal region as well but are less common than germinoma. 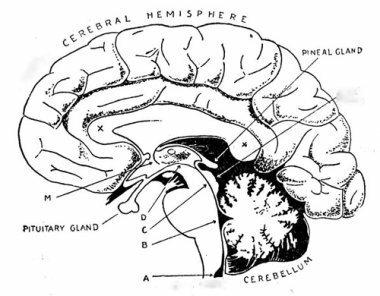 Because the pineal gland sits just above and behind the third ventricle and the cerebral aqueduct, fluid-filled spaces in the brain, an enlarging tumor in this region can compress the aqueduct, cutting off the normal flow of fluid within the brain. This can lead to what is known as hydrocephalus which results in enlargement of the ventricles and increased pressure in the head. This can lead to symptoms such as headache, nausea, vomiting and finally neurological deterioration as it becomes more severe. Other symptoms which can occur due to compression of the surrounding parts of the brain include a paralysis of upward gaze of the eyes and other eye and visual symptoms (due to compression of part of the brain stem called the superior colliculi), disturbances of gait and precocious puberty in children. Patients who present with symptoms suggestive of a brain tumor such as a pineal tumor will generally undergo a thorough neurological evaluation and examination. Often, a neuroimaging study such as a CT scan or MRI scan will be performed to detect the tumor. An MRI shows the most resolution of the tumor and surrounding normal structures. While most tumors in the region of the pineal gland can be identified readily on MRI, it is not always possible to tell what type of pineal tumor it is based solely on the imaging study. For example, it may be difficult to distinguish pineal germ cell tumors from pineocytomas or pineoblastomas. While some of these tumors are treated solely based on the imaging findings, many tumors will require a surgical procedure to obtain tumor tissue which can be analyzed by a pathologist to make a definitive diagnosis. In the case of pineal region tumors, some patients will undergo blood and/or cerebrospinal fluid sampling so that they can be analyzed for two compounds, beta-HCG (human chorionic gonadotropin) and AFP (alpha-feto protein). These compounds can be produced by some types of germ cell tumors. Germinoma however does not typically produce either. Additionally, the cerebrospinal fluid is sometime analyzed for cytology, meaning that it is analyzed for any tumor cells in the fluid. This can indicate spread of the tumor through the fluid to the spinal or other regions of the central nervous system. Some medical centers advocate treating patients who have this tumor with radiation treatments and chemotherapy alone because these tumors are typically very sensitive to these treatments. However, without a biopsy it can be hard to be 100% sure that the diagnosis is acurate. Therefore, in many cases a biopsy or full surgical resection is recommended to obtain tumor tissue for analysis. If the pathologist confirms that it is germinoma, most patients will undergo radiation treatment and/or chemotherapy. If another tumor type is present then surgery to remove as much tumor as possible is usually attempted. Each patient is different and therefore treatment plans should be discussed with each patient's own treating physicians. from the Pineal Germinoma page.